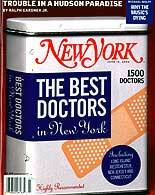 Dr. Glenn W. Jelks was featured in issue of Departures magazine March/April 1997 as one of “11 Top Docs” in the United States. Specializes in : Eyelifts and difficult redos. Everyone mentions him for correcting eye problems, particularly those created by other surgeons.